Anyway, I decided to go the safer route and dip dye my hair purple instead. Now this was very hard because I had just dyed my hair black a month ago. Yes, BLACK. The hardest hair colour to dye over... it's literally impossible. Before I could dye my hair any colour, I had to bleach the heck out of it. Different hair dyes have different amounts of bleach in them and therefore work differently. Unless you are 100% sure that the dye will show up over your natural hair colour, I recommend doing this if you have naturally dark coloured hair (e.g. medium brown to black hair) or if you want a very vibrant colour payoff. The bleach that I used was from the Jerome Russell B Blonde line. I mixed a packet of the powder bleach along with their developer, and applied it onto the ends of my hair. Since I was going to apply another over it anyway, I didn't make any special effort to blend the colour in. I basically applied bleach on the red areas in the above picture. As you can see I applied it in streaks so that I wouldn't end up with a straight line of where the bleach stops in my hair (this is very important!!!). Since I had a limited amount of time, I put my hair in a plastic bag and blow dried the ends for 30 minutes (this causes the bleach to develop faster). I recommend leaving the bleach in for 60 minutes and blow drying it during the last 10 minutes for optimal results. After I washed the bleach out, I was left with ginger ends. Bright ginger. Unfortunately I was silly enough to not take any pictures of my hair before and after. Now I've chopped it all off so I'm left with no evidence whatesoever. If you're interested in how long the colour lasted on my hair, I've done a review on the hair dye here. 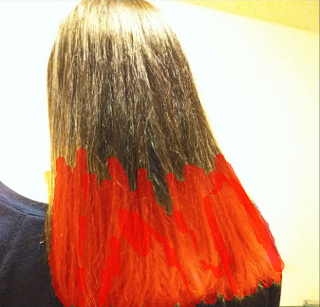 Anyway, I hope you found this helpful and have fun dip dying your hair!! If anyone's going to follow this, it WILL be very damaging to your hair, especially if you bleach it. My hair is comparatively strong (and doesn't take dye very easily), but it still felt dry and strawy after the first few washes. I strongly recommend using leave in conditioner as often as possible after doing this.